Hair loss is a common problem for men and women alike. In fact, it’s common enough that a whole industry exists aimed at stopping hair fall and even regrowing hair. But what do many of these treatment options have in common? Side effects and temporary relief. That’s right – while many purported treatments (such as Rogaine and Propecia) may seem to treat the issue, it only covers it up. So, what’s the alternative? Natural treatment options do exist, and while they may not directly treat hair loss they can help to improve the scalp environment. This will help to improve hair growth. One such option? Pilates, an exercise program created in the 1930s that aims to increase core strength and improve mobility and stability (1). Will practicing pilates mean you won’t go bald, or that your balding will be completely reversed? Absolutely not. After all, there are many factors that play a role in hairline recession and thinning. However, the practice does provide many benefits which can indirectly lend themselves to improved hair health. How Can Pilates Help with Hair Growth? Hairline recession and balding, common signs of Androgenetic Alopecia, are triggered by a variety of factors. These include genetics, lifestyle, diet, and environment. However, more specific factors (such as poor blood flow and scalp tension) can also play a role in hair loss increased shedding. So, how can pilates help? Let’s take a look at these specific factors that may trigger hair loss, as well as the ways pilates may be able to reduce their effects. 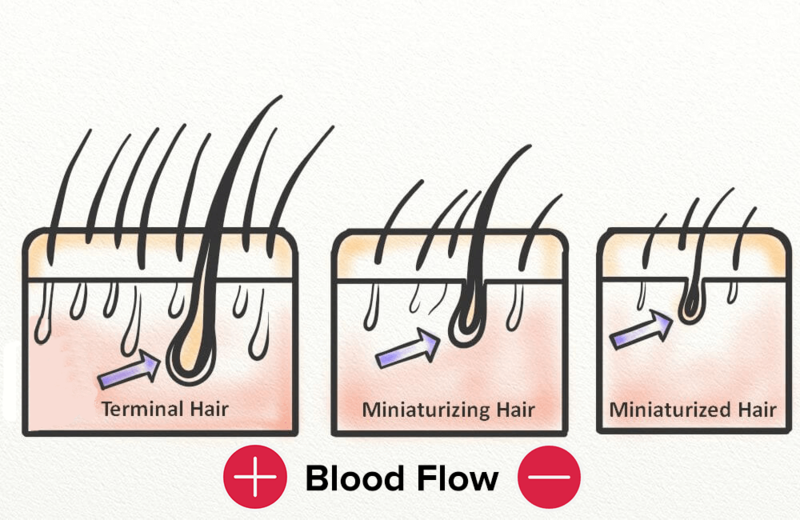 Blood plays a crucial part in hair growth, as it delivers the necessary oxygen and nutrients directly to the hair follicle. Unfortunately, blood flow to the scalp and follicles can be slowed – and even fully stunted – due to inflammation and miniaturization. Miniaturization occurs as the result of DHT sensitivity, which is the main cause of hair loss in people with Androgenetic Alopecia (AGA). Pilates can increase blood circulation to the scalp, which ensures that oxygen and nutrients are delivered (2). How is this so? Pilates is a physical activity, or aerobic exercise. While it may not be as intense as High Intensity Interval Training (HIIT), it still offers cardiac and other benefits. One such benefit is increased blood flow throughout the body (3). This means that, when practiced regularly, pilates may help to increase the oxygen and nutrient levels in the scalp. In theory, this will create a less hostile environment for hair to grow. Blood circulation is certainly important in the delivery of blood throughout the body. But there’s another critical step that many people take for granted: oxygen intake. Pilates is a practice that, quite similar to yoga, focuses extensively on breath control and meditative breathing. This emphasis on breathing patterns, as well as retention, can help to boost oxygen levels (4). One study, published in 2018, showed that pilates training improves 5km run performance (4). This was determined using various measures, including high maximum oxygen consumption (VO2 max), which is the maximum rate of oxygen consumption during aerobic exercises. As hypothesized, the group that incorporated pilates (PG) into their usual routine (which included running) saw an improvement in 5km running time, as well as VO2 max. So, what does this mean for hair health? Oxygen is necessary for the hair growth process, as a certain set of circumstances must be present for the Free Testosterone (fT) which is found in the scalp and hair follicles to be converted to DHT (with the assistance of 5AR) (5, 6). One such factor in this process? Oxygen levels. This is because the levels of oxygen can essentially determine what substance is produced as a result of the interaction between fT and 5AR. In low oxygen environments, DHT is the likely by-product. 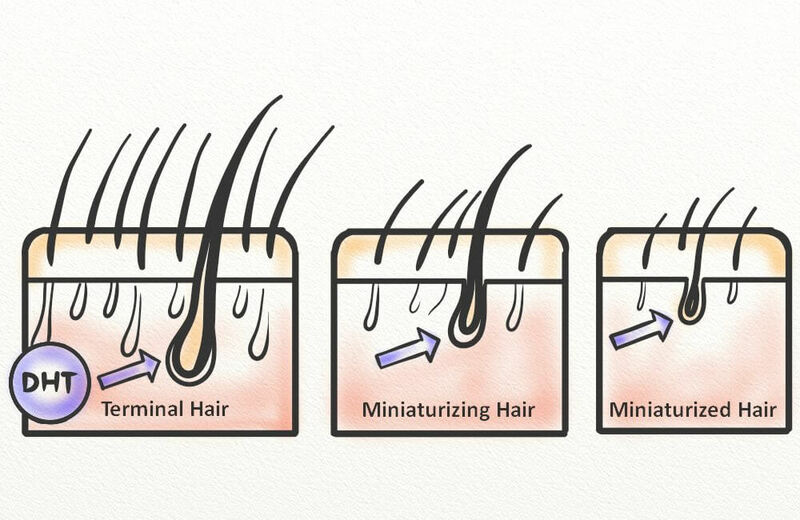 DHT is known to trigger miniaturization and hair loss in men and women with AGA (7). As such, this conversion is not conducive to hair growth. However, high oxygen environments produce another by-product: estradiol (8). This estrogen steroid hormone has actually been shown to promote hair growth (9). And since increased levels of VO2 max translates to improved oxygen circulation throughout the body, it makes sense that pilates (and other aerobic exercises) can contribute to improved hair growth indirectly (10). Will this reverse the effects of balding? Not necessarily. However, it can reduce the odds of further hair fall and make it possible for further growth to take place. Depending on the current severity of your hair loss, this may lead to you regrowing your lost hair. But also remember, there are many factors which contribute to hair fall. While poor oxygen levels are one factor, there are others to consider (and treat accordingly). Chronic stress is a problem for millions of Americans and, unfortunately, it’s not something that many people are equipped to handle naturally (11). However, pilates and similar practices can help to reduce stress levels (1). But what does stress have to do with hair loss? Stress is a biologic response to internal and external stimuli and, as such, is natural (12). When it’s not handled properly, though, it can lead to numerous biological responses both general and local (13). These responses can have a negative impact on your body, including your organs, and hair is not immune (13). A 2017 pilot study showed that hair growth was interrupted in women during a stressful exam period, and the impact on growth lasted even after the exam period has ended (14). 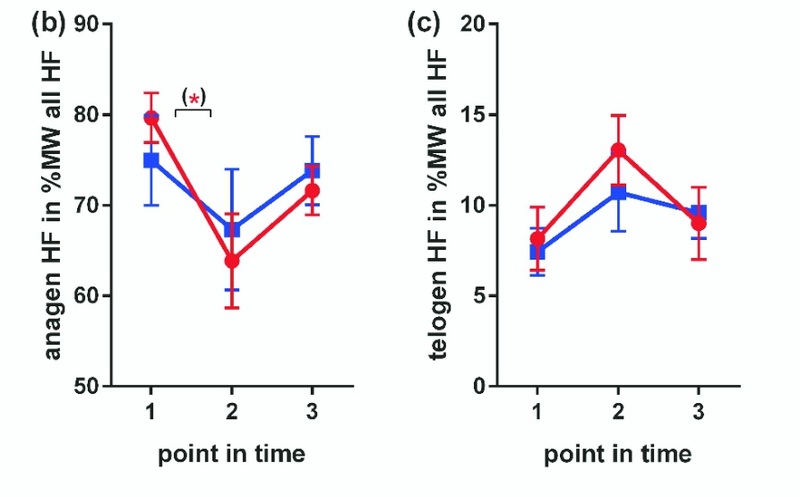 The percentage of hairs in anagen and telogen phases, respectively, for the exam students (red) and non-exam students (blue). Source. So, what can be done to combat it? As mentioned above, pilates can be used to reduce stress levels. One study to highlight this was published in 2010 (15). It showed that college students who took part in a movements-based course (including Pilates, Taiji quan, or Gyrokinesis) saw improved levels of mindfulness which translates to better sleep quality and perceived stress (15). Posture and the way we carry ourselves throughout the day has a direct effect on our physical health (17). This tension can even have a direct impact on hair loss. How? 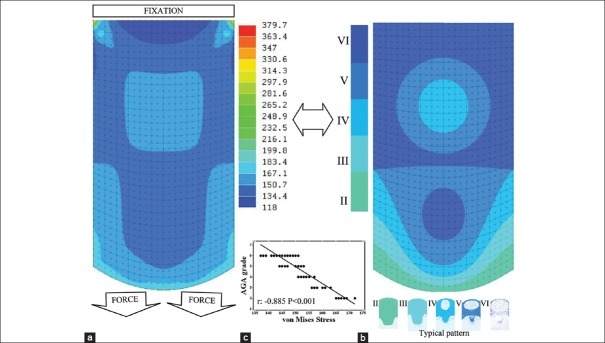 As the diagram below shows, the areas of highest scalp tension correlate strongly with the patterns of hair loss often associated with Male-Pattern Baldness (MPB) (18). This isn’t a coincidence. That’s because tension (also called mechanical stress) can severely restrict blood flow and reduce delivery of oxygen and nutrients to the follicles. This soon leads to miniaturization. So, what can you do to improve your posture and reduce scalp tension? Pilates! Pilates, a practice that focuses on core strength in order to increase stability and movement, can help to improve posture (19). In turn, practitioners may experience a variety of benefits including reduction in chronic pain, improvement in cardiovascular function, and an increase in flexibility (20, 21, 22). And improvement in posture can also contribute to reduced tension, as your neck, shoulders, and back will begin to take less of the brunt of daily living. This can have a direct impact on the scalp’s mechanical stress. More specifically, it can reduce tension that may affect the scalp and improve blood flow to the thinning/balding areas. The above video offers a short pilates workout to help to release tensed muscles and reduce neck and shoulder pain. Pilates is quite a diverse exercise program, with a variety of movements that can impact a wide variety of health problems and hair loss triggers. The three exercise movements below have different effects, but all can be performed by beginners. Lie on a mat with your spine in neutral position (23). Bend your knees and lift your shins so they are parallel to the ground. Support the base of your skull and neck using your hands, and pull your abdominals in tight. Upon exhale, extend your left leg out rotate your torso towards the right knee. Your left elbow should be moving towards the right knee, and your left armpit should align with it. Inhale, and bring your body back into neutral position. Exhale, and extend your right leg. Now rotate your torso towards your left knee. Repeat these steps 5 to 10 times. NOTE: Throughout this movement, you want to keep your chest open and your elbows wide. You should be using your abs, not your arms, for support throughout this exercise. Start by placing your feet hip-width apart, and be sure your spine is in neutral position. Your arms should relax – hanging loosely – at the sides of your body. Inhale deeply, and lengthen your spine as you do. Pull your abdominals in tight and keep them engaged through the rest of the movement. Exhale slowly and in this one exhalation tuck your chin towards your chest and begin to lengthen the back of your neck. Let this movement naturally continue into your upper back, and let your shoulders drop forward as your back begins to bend. Be sure your knees are slightly bent, and continue to slowly bend forward as your roll your spine forward and down. Your arms should continue to dangle from your shoulders as you continue this movement until you’re as far as you can go while still relaxing your neck, shoulders, and back. Inhale slowly and, upon exhalation, begin to slowly unroll yourself from the lowered position. Tuck your pelvis slightly (being sure to keep your abs engaged) to make the movement more smooth, and slowly roll back up until you’re in the beginning position. Repeat the movement about 8 to 10 times. This movement also has the benefit of increasing blood flow to the scalp. You can even hold the movement in place for a few breaths to really get the benefit of inversion. The neck pull is a movement with an intermediate difficulty, but one that still offers many benefits (especially as it pertains to upper back and neck tension). That’s why I’ll offer a slightly modified version of the neck pull, which will enable even beginners to complete the exercise. Begin by sitting upright with your legs directly in front of you. Bend your knees slightly, and pull them towards you about halfway until they’re loosely bent (you should be able to place your hands comfortably on your knees). Place your feet firmly onto the ground, and straighten your spine and neck. Your abs should be engaged. Now place your hands behind your neck and, upon exhalation, slowly tilt yourself backwards until you’re at 45 degree angle. Then use your core muscles to bring yourself forwards and towards your knees. Tuck your hint towards your chest as you do so, and bring your forehead down to your knees without touching. CAUTION: Be sure not to pull on your neck with your hands. They’re simply there as a support and to improve posture, but they should not be used to complete the movement. Slowly unfurl yourself, lifting your back and your neck until you’re in the starting position. Complete this movement 5 to 10 times. As a form of aerobic exercise, you should consult your physician before beginning a pilates exercise program. If you have any previous injuries that may become agitated during pilates, you may want to work with a licensed pilates instructor to ensure your form is correct. They can also help you to modify exercises to avoid injury aggravation while optimizing strength building. And most important, you should know (and heed) your limitations. This may mean starting out more slowly, and introducing new movements on a less frequent basis to ensure proper form. Will pilates solve all of your hair loss woes, and leave you with a head of full, luscious locks? Not likely. Though, it does offer many benefits (general and targeted) that can contribute to a healthier body overall. This can lead to healthier hair in the long run, and may make it easier for hair growth to occur. As such, a weekly pilates session may not lead you to directly sprout hair but it can make it possible for your scalp to do so over time. This is especially true if your hair shedding and balding is a result of any of the above mentioned factors. And of course the other health benefits (including improvements in cardiovascular health and pain relief) cannot be denied, either (21, 20). This is why I highly recommend you at least give pilates a try.